photo © Jo-Anne McArthur for Village of Dreams Productions Inc. When TVO put out a tender entitled “Here, Now, 150” seeking proposals for documentary films that reflected upon our evolving Canadian identity with a focus on diversity, I knew I had to pitch what became Little India: Village of Dreams/villageofdreams.ca to explore the vibrant and diverse Toronto neighbourhood known as “Little India” (formally known as the Gerrard India Bazaar). Behind myriad, colourful restaurants, beauty shops, clothing and grocery stores are the South Asian immigrants and entrepreneurs who founded this community 40 years ago. Now, the westernized second generation is adapting and reshaping these family businesses for the 21st Century. This is a very Canadian story and an important story of Toronto’s evolution. I was born in Mumbai, India. My parents James and Margaret Beveridge moved there in 1954 and my father became Executive Producer of the Burmah Shell documentary film unit, which was embedded at the newly formed Indian Films Division. Dad’s task was to use documentary film as a form of nation building, modeled after techniques developed at the National Film Board of Canada of which he was a founding employee and John Grierson’s right-hand man. We left India when I was only 10 months old but I returned as a teenager to study at Woodstock School in Mussoorie and later I studied fine arts for one year at MSU in Baroda. I made numerous trips and travelled the country widely. My parent’s last project of their careers was to establish the Jamia Millia Mass Communications Research Centre in New Delhi in collaboration with former Education Minister A J Kidwai and York University. I grew up with Indian guests in our home, eating Indian food, discussing Indian values and politics and enjoying many friendships with Indians, so I feel very connected to Indian culture. In 1997 we moved just 2 blocks from the Gerrard India Bazaar. Bringing our kids up and running a production studio at the same time was intense, so I didn’t get to spend much time there but I saw it changing over the years and I wanted to know more. I saw this project as a chance to reconnect with a culture that I share and to explore a community that was right beside me, working essentially as an embedded film unit. In a time where politics and media are becoming increasingly divisive I also saw a chance to tell a success story about diversity. 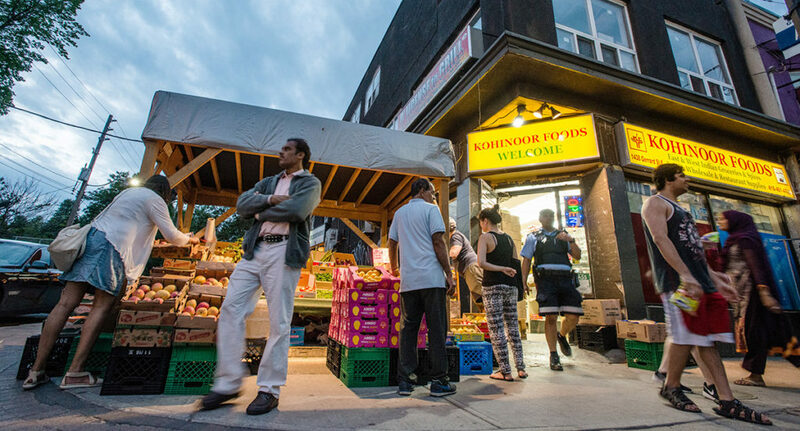 Kohinoor Foods is in the heart of Gerrard India Bazaar and was established in 1978. I am very intrigued by observational documentary, and when I meet or see compelling people and/or situations, I dream of making a fly-on-the-wall observational film about them. Working with my lean, mean and very skilled production team of Cinematographer Bongo Kolycius and Location Sound Recordist/Editor Paul Hart (my life & business partner), we set out to do the best we could with a limited amount of shoot days. Our observational footage was anchored by interviews with each character that we used to shape the arc of our character’s stories. I wanted an organic look to the film and Cinematographer Bongo Kolycius delivered, filming the entire documentary hand-held. Bongo captured some beautiful moments throughout the project as he became familiar with our characters and the layout of the Bazaar, but one moment was entirely spontaneous. It happened on our first day of filming with Adam and Ayaan Sayani, and it was Bongo’s first day with his new SONY Fs7 camera which he purchased to make the film. We went to meet Adam and Ayaan to test the camera out and to get them comfortable, and after an hour or so they were inspired to open up their father’s memory box for the first time since he had passed away and explore it. Our son Liam Hart filmed the timelapse sequences, which served as a device to create energy and a sense of urgency and constant change. The timelapses transcend the day-to-day imagery of the Bazaar from mundane to poetic. We were in post production from October 2016 to May 2017. Paul Hart is a master editor and applied his craft with precision and patience. We delivered a rough cut in the beginning of January and two fine cuts after that, before going into colour correction and packaging. There were three basic blocks to our story structure that informed our shoot plan as well as the edit. Who are our characters? What are the challenges that they face in life? How do they deal with those challenges? Once we built the basic structure of each family story, we then wove them together, using imagery of the Bazaar as transitional bridges. As soon as we had a picture lock we got to work with the excellent musical composition team of Philip Strong and Thomas Hoy. Their challenge was to create a soundtrack that was a blend of Indo-Pakistani and Western. Each of the four families has a distinct musical styling yet Philip and Thomas managed to bridge the tracks together seamlessly. The music track blended with some beautiful sound design from Alan Geldart, all mixed together by the team of Daniel Pellerin and Brett Killoran. Paul and I both like to explore our creative mediums and we both wear many hats. In “Little India: Village of Dreams” Paul was a very capable Location Sound Recordist and he also edited and on-lined the film in our editing facilities at Beevision. I am a web designer so I am very hands on with the website, and I created the graphics and animation for the film, working with the the talented graphic artist Jenny Armour and a character from our film – Sumaiyah Shah. I was so impressed with Sumaiyah’s henna skills that I asked her to create a pattern which Jenny then converted into an illustrator file and which I then animated for the opening and the name supers. The South Asian community in the Bazaar, despite its many differences of nationality, region, culture and religion, is united in its goal to survive and prosper as a market place. The business community works hard, and has weathered tumultuous events that have severely impacted their customer base including Air Canada flight 182, 9/11, SARS, plus technology advances (DVD / internet) and the overall cultural growth of Canada’s ethnic communities. When Little India formed in the mid 1970’s, spawned by the opening of a Bollywood Movie Theatre called The Naaz, it was the only South Asian hub around and 75% of its business came from outside of the GTA. Now there are South Asian communities with strong concentrations spread across the country and outside of Toronto in places such as Brampton, plus large franchises such as Loblaw Group are selling ethnic specialty food items within their stores. The Bazaar has to constantly push to establish its point of difference to continue to attract customers. Now it is billed as the largest outdoor market in North America, and this is evidenced by how the place comes alive in the summer months. It wasn’t easy finding our film subjects. We set up a tent at the 2016 Festival of South Asian and distributed fliers and postcards. I presented my project to GIBBIA (Gerrard India Bazaar Business Improvement Area) and made email calls out for participants. I walked up and down the Bazaar on an almost daily basis getting to know the shop owners and seeking out subjects for the film. Our primary POV was going to be from the children of the immigrants who first came to Gerrard St. Many of the 1st generation Canadian born children have moved on to other careers, and almost all of them have attended university. We were immensely fortunate to connect with Chandan Singh, Harleen Khorana, Adam Sayani, Sumaiyah Shah and Aysha Khan. 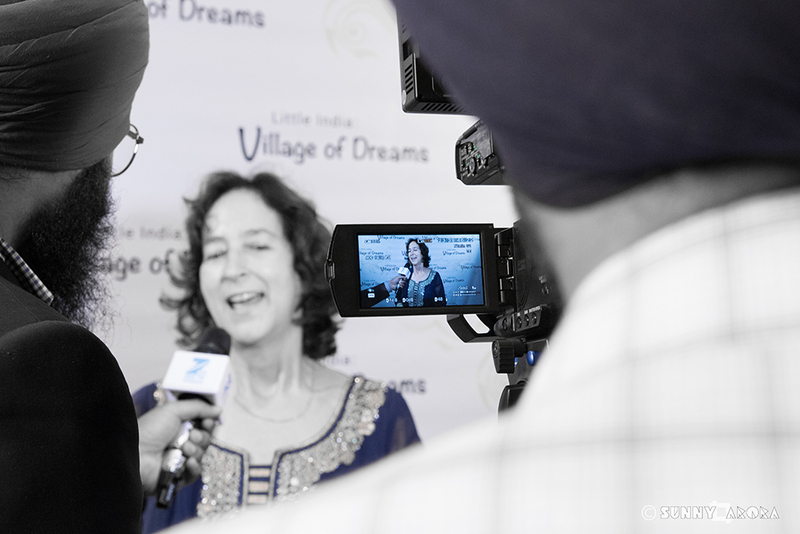 Village of Dreams is a cross-platform documentary project comprised of a one hour film on TVO (Little India: Village of Dreams) that premiered on July 1st/Canada Day; a 70 min. festival film; a website www.villageofdreams.ca which includes over twenty web portraits to complement the film, a photo and non-fiction story contest entitled “What’s Your Bazaar Memory?” and a robust social media campaign. 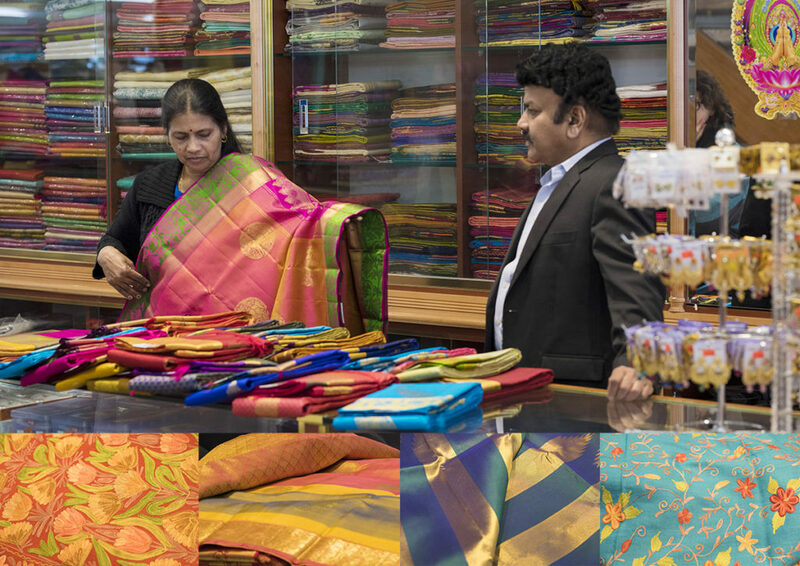 Neelam Silk sells spectacular Sri Lankan silks amongst a rich array of other shawls and sarees. I wanted our project to paint a wider canvas of the Bazaar than what could fit into a one hour character-driven film, which is why we created (and are still working on) a series of web portraits. Each portrait focuses on a different business owner in Little India and reflects upon topics such as their origins, religion, culture, hopes and dreams as well as festivals, holidays and the history of the Bazaar. 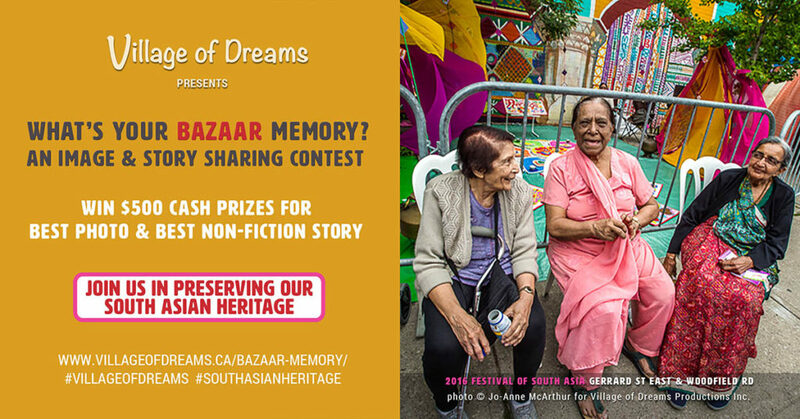 We also ran a photo and non-fiction story telling contest called “What’s Your Bazaar Memory?” This is the ‘social’ arm of our cross platform documentary project, an exercise in gathering UGC (user generated content) and in gathering and archiving history. 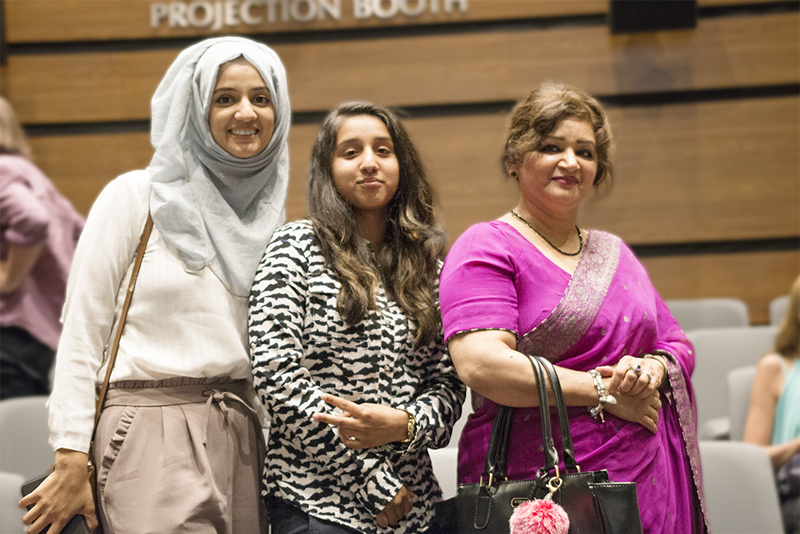 The City of Toronto Archives and the Gerrard/Ashdale Library partnered with us in this venture and along with TVO, selected the nominees and winners. Little India exploded onto the scene in 1974 and has continued to transform over the forty plus years of its existence. These days the talk is of gentrification. As a filmmaker I realized that there was very little film and photography available of Little India in its heyday and the contest was an effort to see if we could uncover some nuggets of history from the community. The winners will be announced at the 2017 Festival of South Asia on July 22/17. The City of Toronto Archives have been great supporters of this initiative and we are discussing ways to create a beautiful legacy for the “What’s Your Bazaar Memory Contest? Over the summer I’ll be blogging about other people in the Bazaar, to add yet another layer of content and to cast the net a little wider. Now I love walking down the street of my neighbourhood, knowing the faces and stories of so many of the business owners there. I’ve made many new friends. The project was very fulfilling as it allowed me to reconnect with my Indian roots and to become a part of a complex, culturally rich and dynamic community while I pursued my art. At the City of Toronto Archives. Top 2 images - the massive vaults that archive Toronto's history. Bottom left - Michele Dale, Supervisor, Collection Management and Standards,City of Toronto Archives and Nina Beveridge. 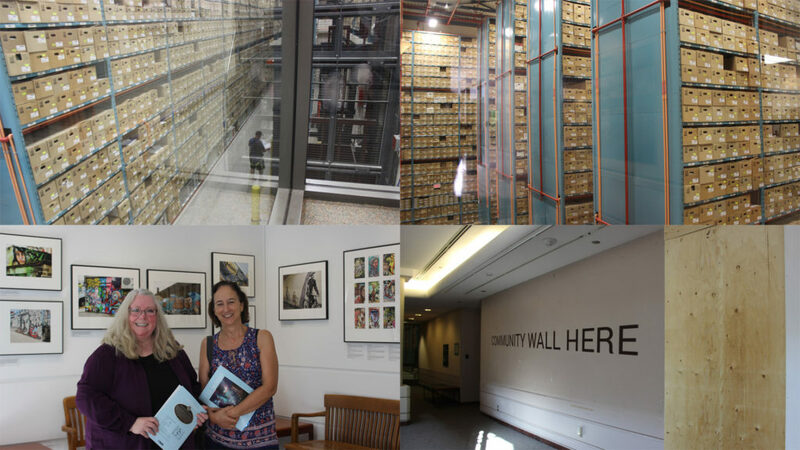 Bottom right - the City of Toronto Archives New Community Exhibit Wall.